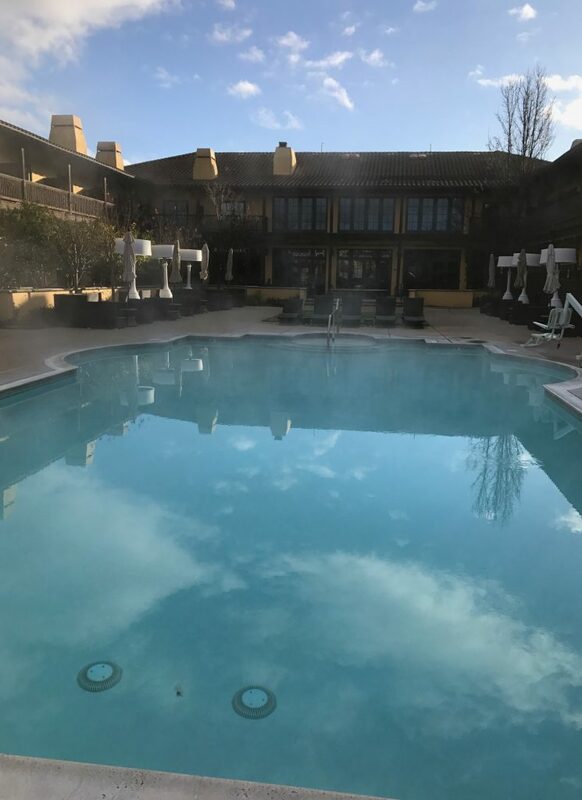 We stayed at The Lodge at Sonoma Renaissance Resort & Spa, which is part of the Marriott Hotels collection. We were very pleased with this hotel; it has good amenities (gym, pool, hot tub, spacious lobby, good hotel bar, decent restaurant, comfortable beds), is in a good location (~25 minute walk to Sonoma Plaza, also a free hotel shuttle to City Hall that runs until 10:45pm), with the added bonus of earning Marriott points (which we can now redeem at Starwood properties at a ratio of 3:1). The hotel upgraded us to a Cottage room for free; we were told this was due to my Marriott status, though we were also aware that they were remodeling several of the rooms in the main building, so it’s possible they had to upgrade us. Either way, we were very happy with our spacious room that included a fireplace, patio, and soaking tub. Sonoma is easily accessible from San Francisco. 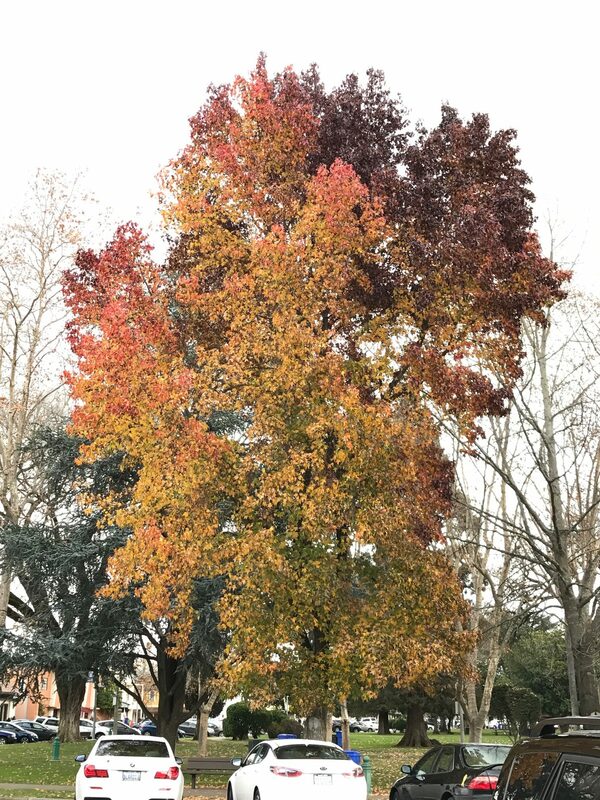 We arrived in the late morning on Saturday, December 31st and there was no traffic – I think the drive took us less than an hour. Easy peasy. 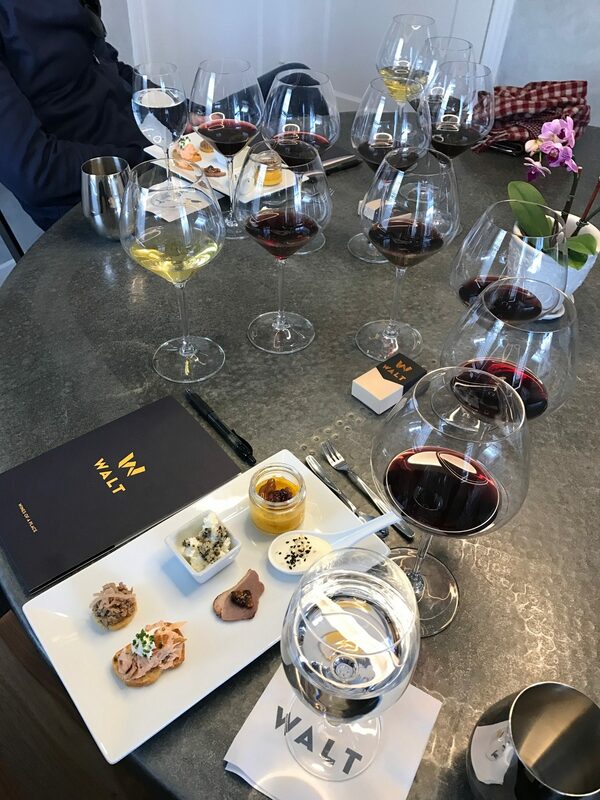 We drove directly to WALT Wines, where we had reserved the special Root 101 wine tasting with food pairing ($60 per person). 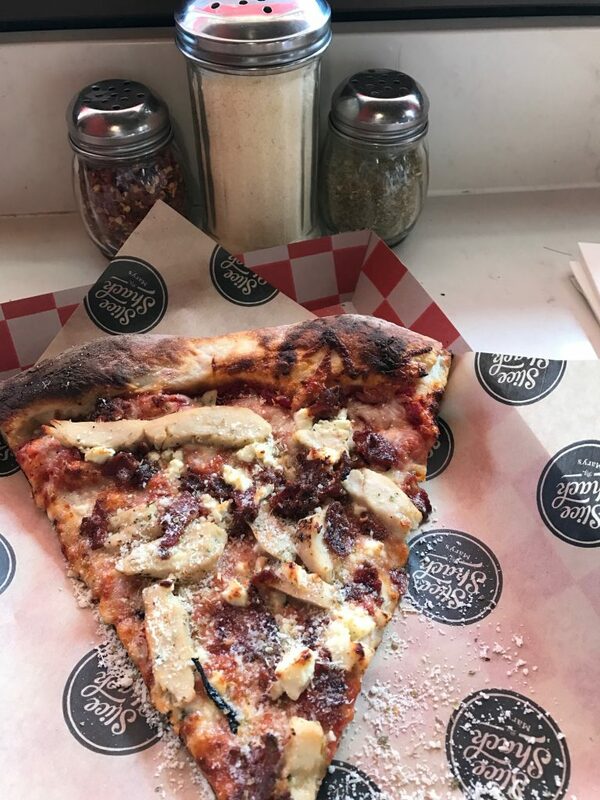 We arrived a bit early and we knew our tasting would only include “bites,” so we decided to grab a quick slice of pizza from Mary’s Slice Shack just around the corner. Having grown up in Petaluma, I have very fond memories of eating at Mary’s Pizza Shack, so this was a great light meal with a heavy dose of nostalgia. We first discovered WALT Wines over the summer when we were visiting Sonoma for the day. WALT specializes in pinot noirs and chardonnays from California and Oregon. Their style of wines is right up our alley, and they have some pretty decent pinots for $40. 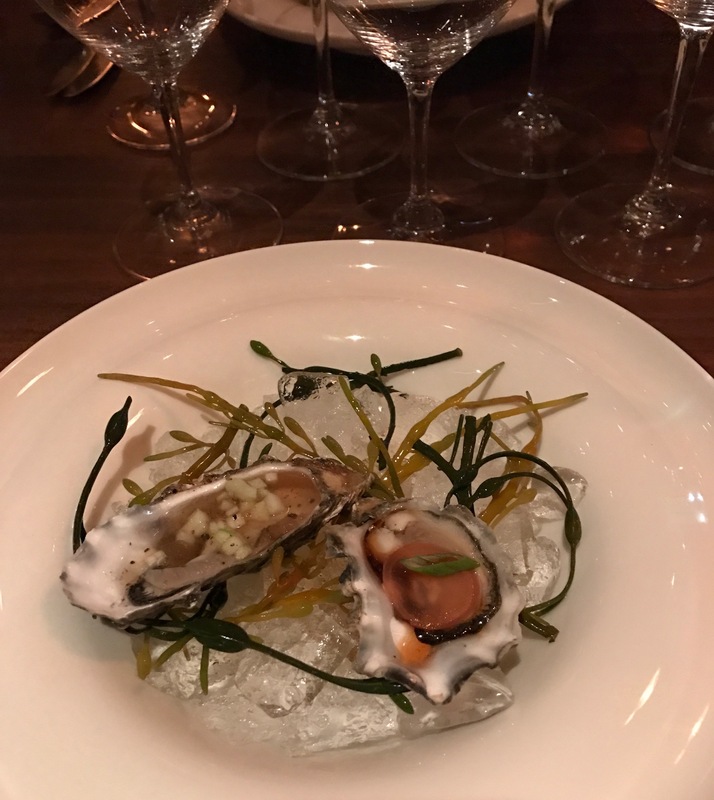 The pairing was very special: we were escorted into a private room where the different wines had been set up, accompanied by delicious bites from nearby restaurant The Girl and the Fig. Our personal sommelier was very informative as he walked us through our tasting. 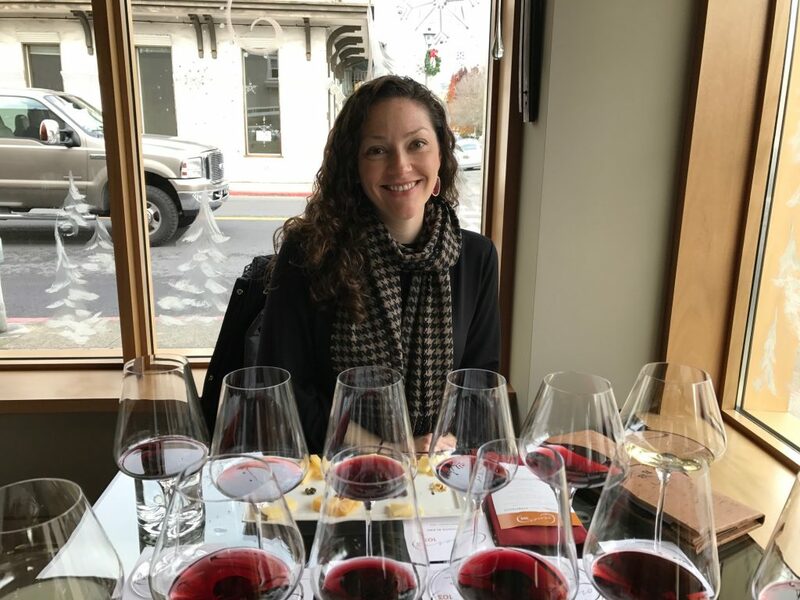 We tried one chardonnay (Sonoma Coast) and five pinot noir wines (Willamette Valley, Anderson Valley, Sonoma Coast, and Central Coast). The food pairing included the following items (starting with yellow jar, going clockwise): butternut squash sformata (savory custard/soufflé) with pinot poached cherries, savory goat cheese panna cotta with black sesame seeds, house smoked duck breast with mostarda, hot-smoked salmon with crème fraiche and chives, duck liver mousse with pinot noir poached shallots on brioche, and house made ricotta with truffle pesto. The salmon and savory panna cotta were my favorites. For dinner we had made a reservation at one of our favorite restaurants in Sonoma: El Dorado Kitchen. This was New Year’s Eve, so they had a special prix fixe menu for the evening. 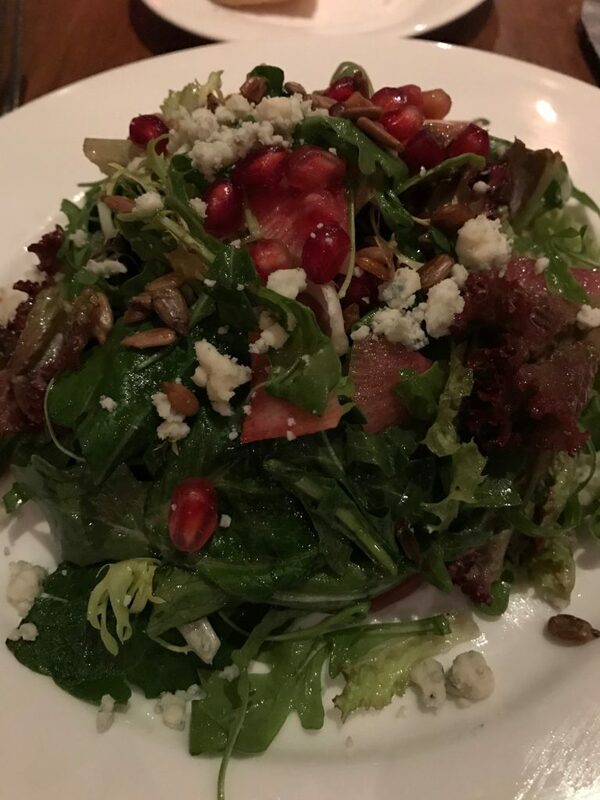 We shared some oysters to start, then I had the mixed greens salad with persimmon, pomegranate, blue cheese, pickled red onion, sunflower seeds, and sherry vinaigrette. It was tasty and nourishing. Jack ordered the pork belly and scallops, though I spared him and did not insist on photographing his food! 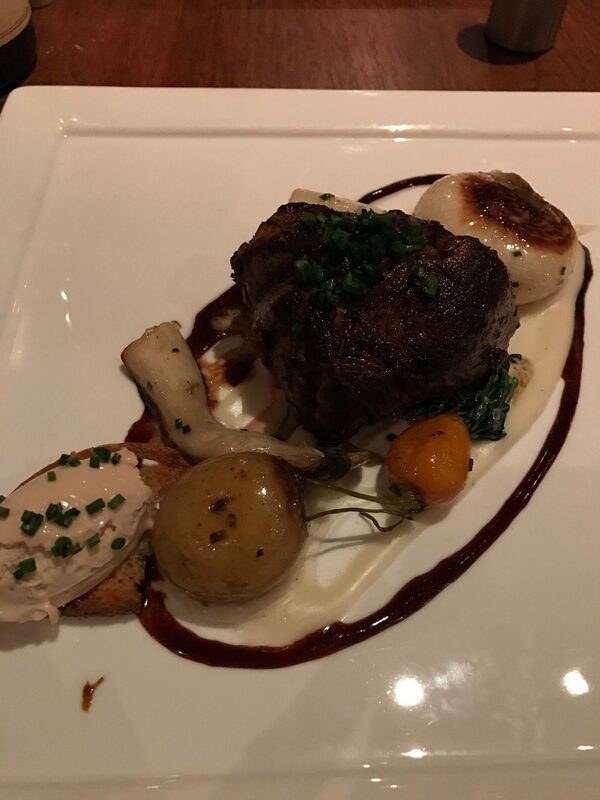 For my entrée I had the filet mignon with potato purée, cipollini onion, yukon potato, king trumpet mushroom, horseradish crème fraiche, and bordelaise. It was quite tasty and cooked perfectly medium rare, though I have to admit that I much prefer a cut of beef with more flavor (bavette steak, hanger steak, ribeye). I did find it odd that this dish came with a healthy serving of foie gras which was not mentioned in the description on the menu; I’m sure this was just an oversight, but foie gras is definitely a food that many diners avoid on ethical grounds and it may be upsetting for them to find a surprise scoop on their plate (I gave mine to Jack). 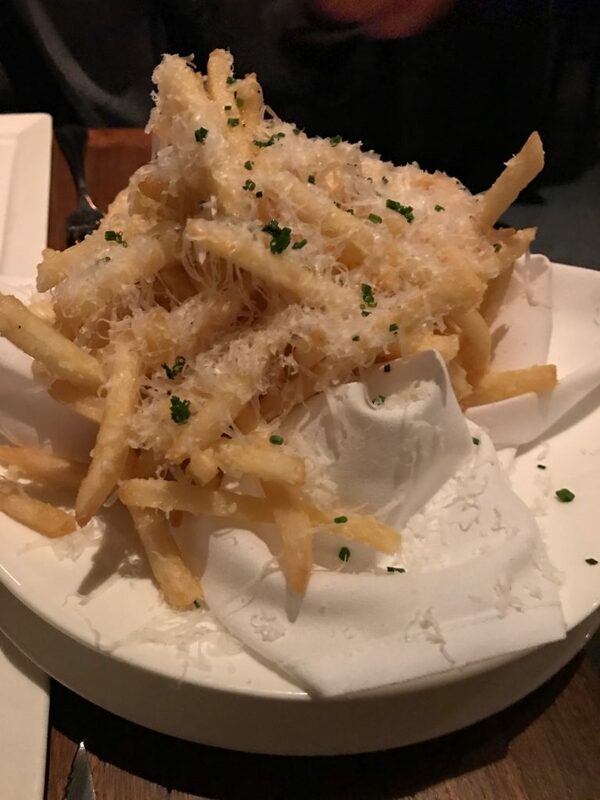 We also ordered a side of truffle fries, a beloved item that is on the regular menu. They were just as addicting as I remembered. 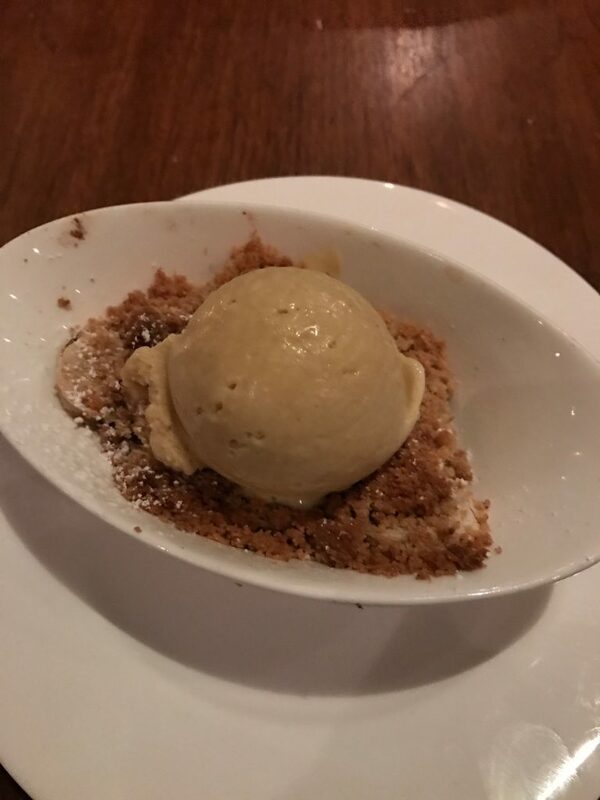 For dessert I had the banana crisp with lemon curd and brown butter ice cream. 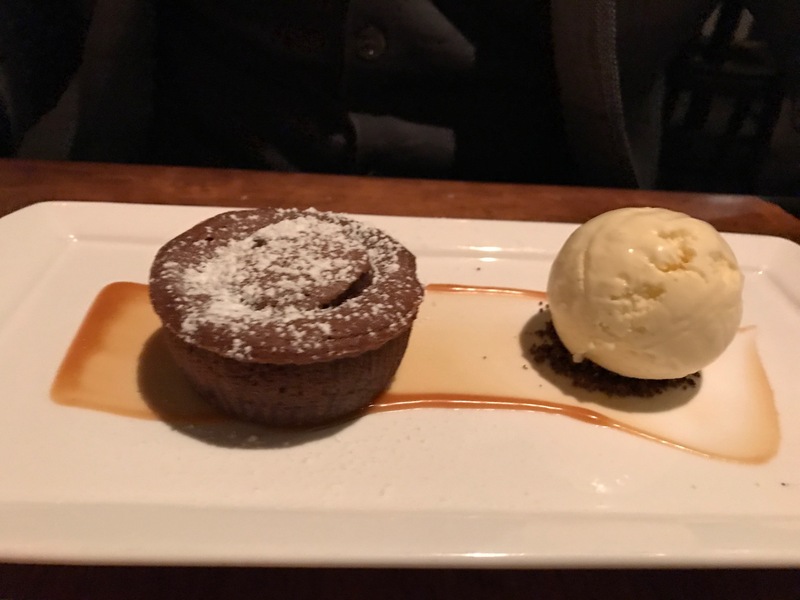 Jack got the molten chocolate cake which was a bit on the dry side – we both liked mine the best. 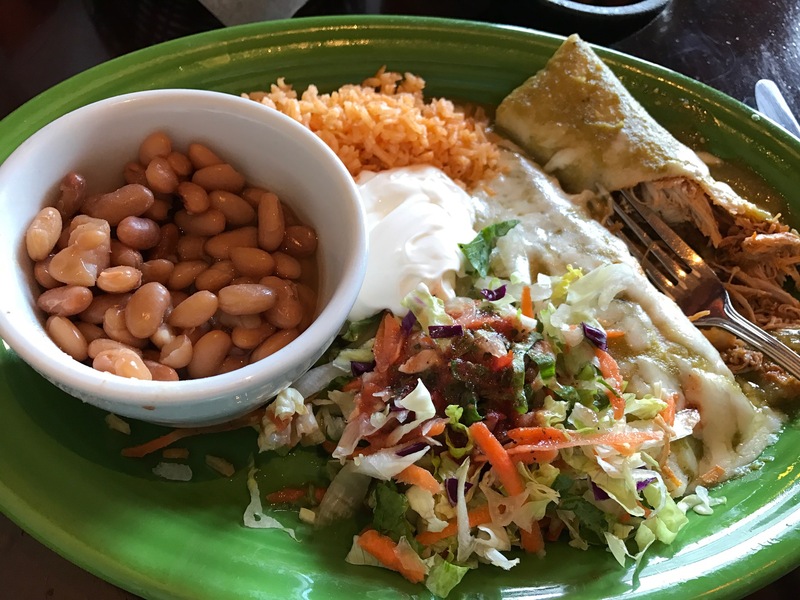 Overall, we had a nice, romantic dinner at El Dorado Kitchen, but it was not our favorite meal that we’ve enjoyed there; we much prefer their regular dinner menu. The next day was New Year’s Day and a lot of restaurants and wine tasting rooms were closed for the holiday. 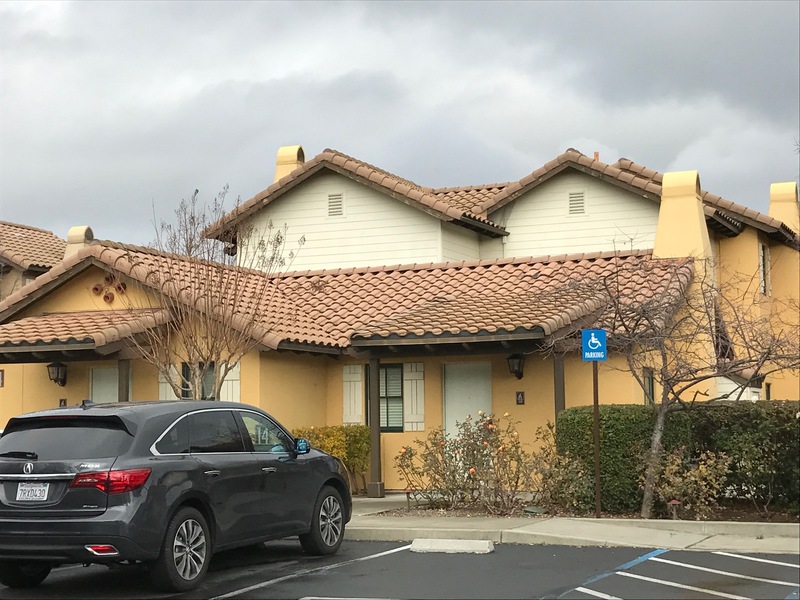 Luckily our hotel had a list of places that would be open, so after a delicious breakfast at the hotel restaurant, we walked to Sonoma Plaza to do a little wine tasting. We tasted at a forgettable tasting room that charged $25 per tasting (!!) PLUS tax. In addition, the credit card payment service they used had a line for tipping. We found that a bit absurd for a run of the mill wine tasting. 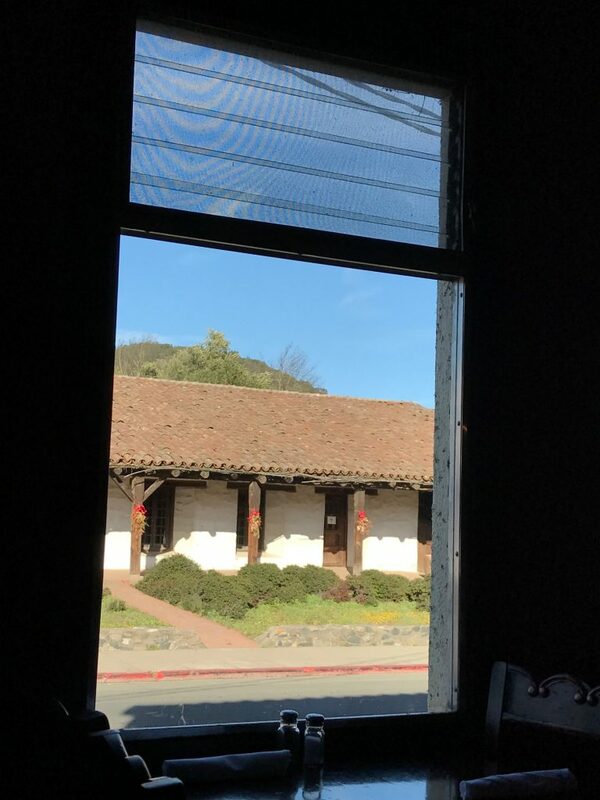 Afterward we had lunch at La Casa, a great Mexican spot and institution right on Sonoma Plaza. I had a delicious, hearty meal of enchiladas Suizas (“Swiss enchiladas” which apparently refers to the large amount of dairy in the recipe). It hit the spot. For dinner I had made a reservation at a spot called Zina Lounge. 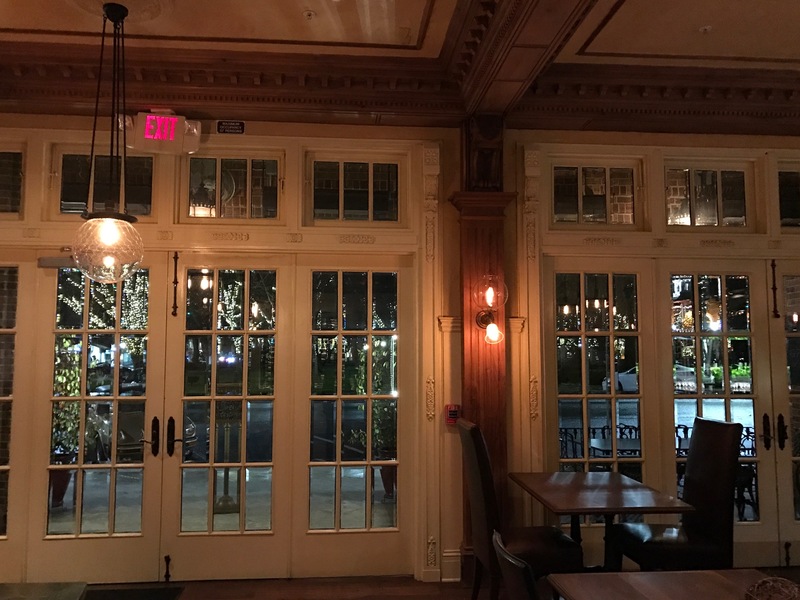 The restaurant is essentially the lobby of the Ledson Hotel, which offers a four or six course prix fixe meal with wine pairings for a reasonable price (4 courses with wine pairing $90/person; 6 courses with wine pairing $150/person). 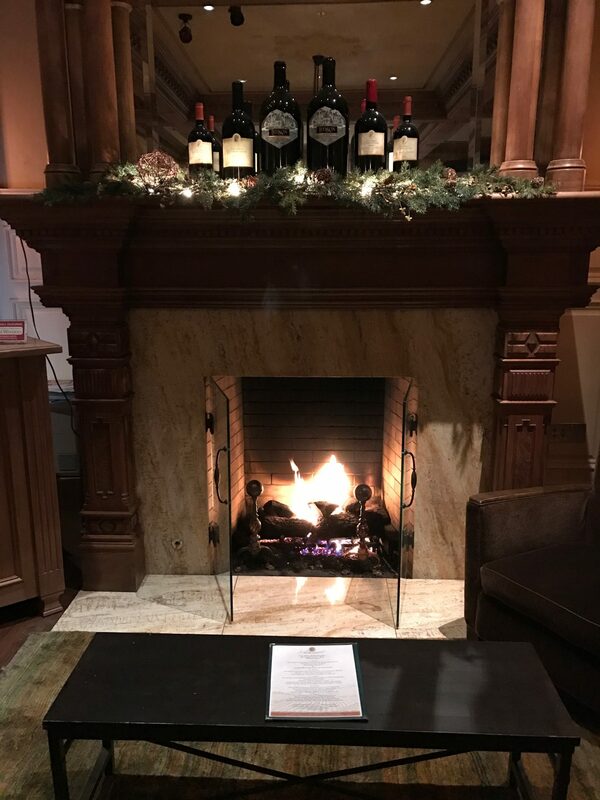 The menu is designed by Executive Chef Yoshiharu Sogi, who combines “Japanese flavors, French technique, and local foods to create unique dishes designed to pair with each of our selected wines.” The setting is elegant and romantic; the hotel feels like it was build in Victorian times, but it was built in 1999! We were blown away by this fact. Our first course was Fanny oysters two ways: apple honey mignonette and sauvignon blanc lime ponzu with pickled radish paired with a 2014 Russian River Sauvignon Blanc. 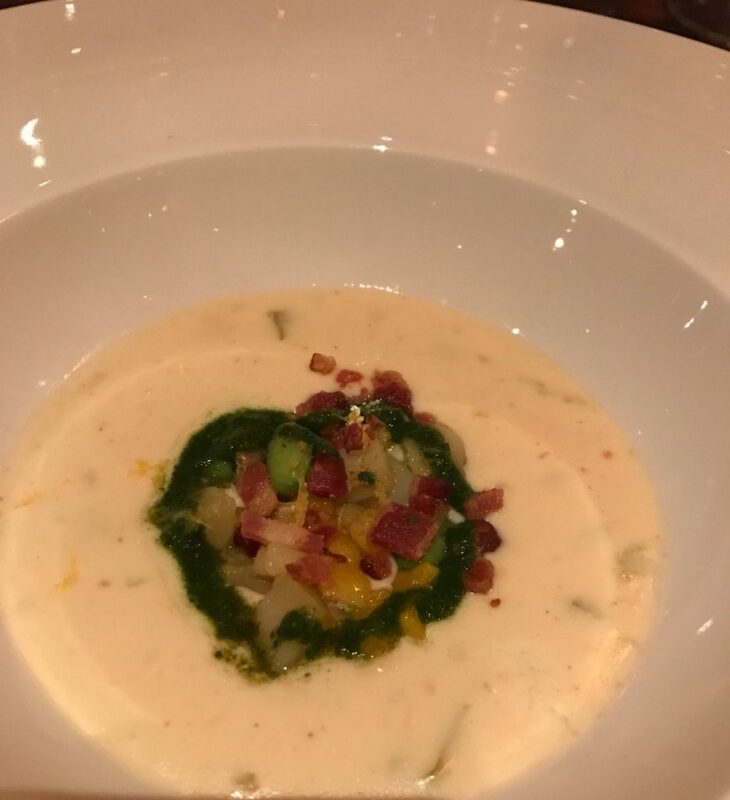 Our second course was a wasabi accented yukon gold potato chowder with corn, edamame, crispy bacon crumbles, and lemon zest, paired with a 2014 Anderson Valley Chardonnay Reserve. 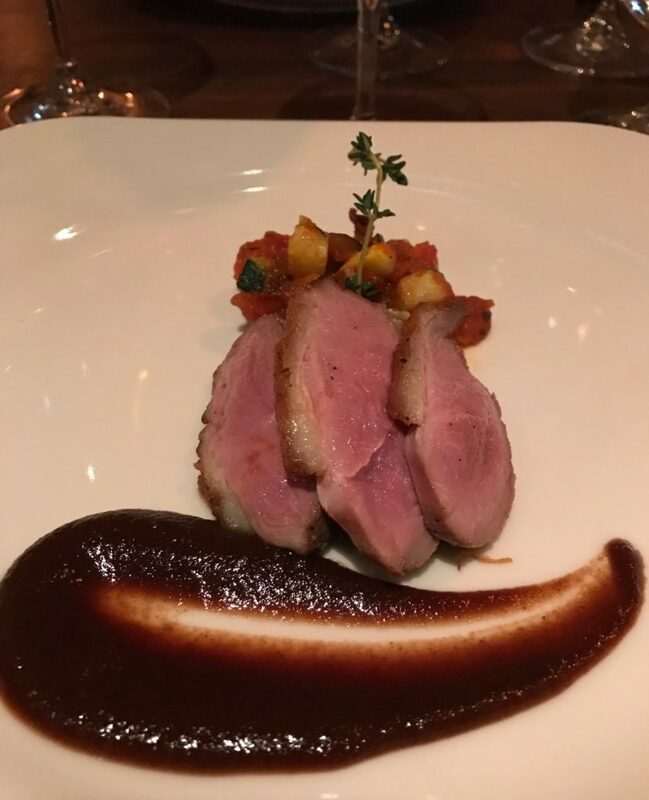 Our third course was an oven roasted Grimaud Farms muscovy duck breast with shredded duck leg confit with sweated leeks, sundried tomato hummus, ratatouille, and fig balsamic jus, paired with a 2010 Mendocino Redwood Valley Carignane. The pesto was a bit salty and I wished they had provided us with steak knives to cut the tender duck. 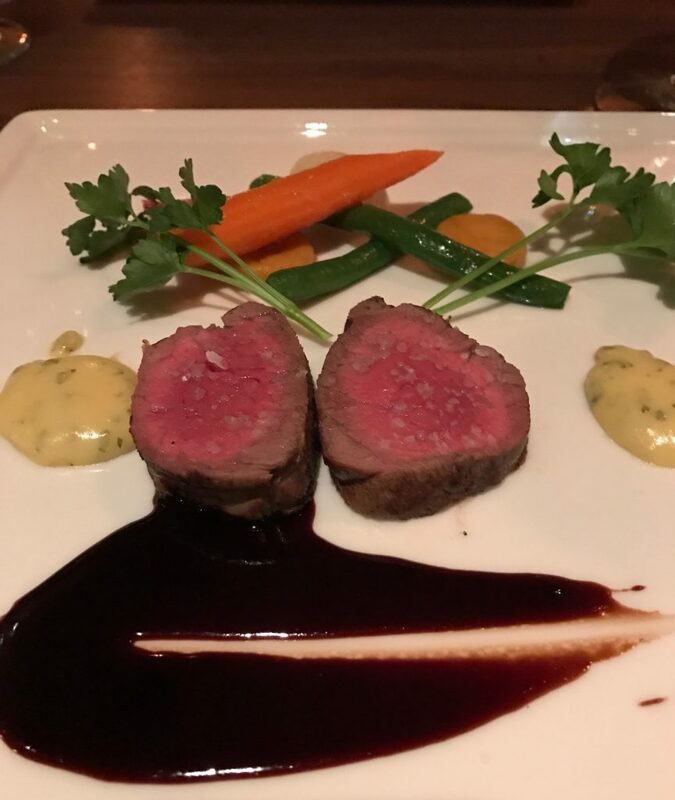 Our fourth course was a Beeman Family Ranch Akaushi beef tenderloin with sautéed carrots, oven roasted beets, slow braised turnips, Kabocha squash gnocchi, Béarnaise sauce, and red wine demi-glace. It was paired with a 2012 Napa Valley Cabernet Sauvignon. 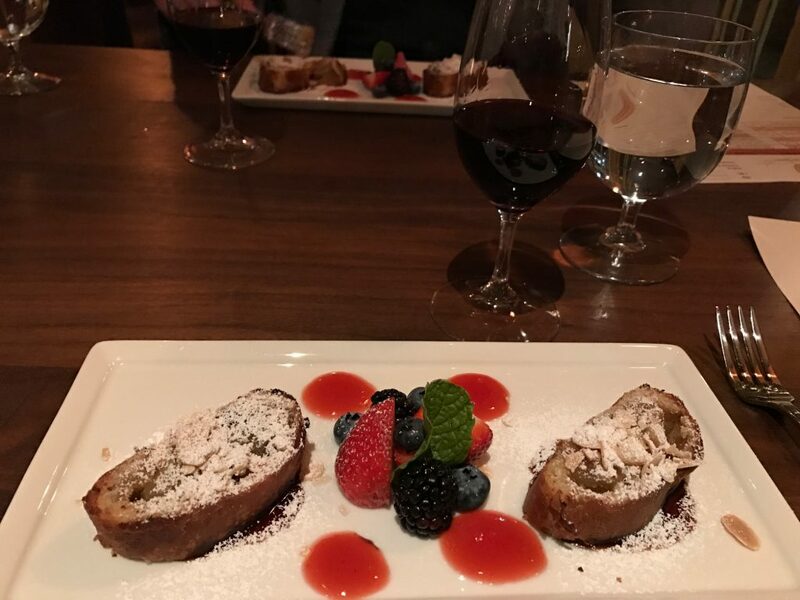 We opted to spend $25 more per person to get dessert and port: dessert was a Granny Smith apple, raisin, and almond cream strudel with Ledson Zinfandel chocolate sauce and strawberry coulis, paired with a 2014 Redwood Valley Zinfandel port. We were very impressed by the service, ambiance, food, wine, and price of our dinner at Zina Lounge. 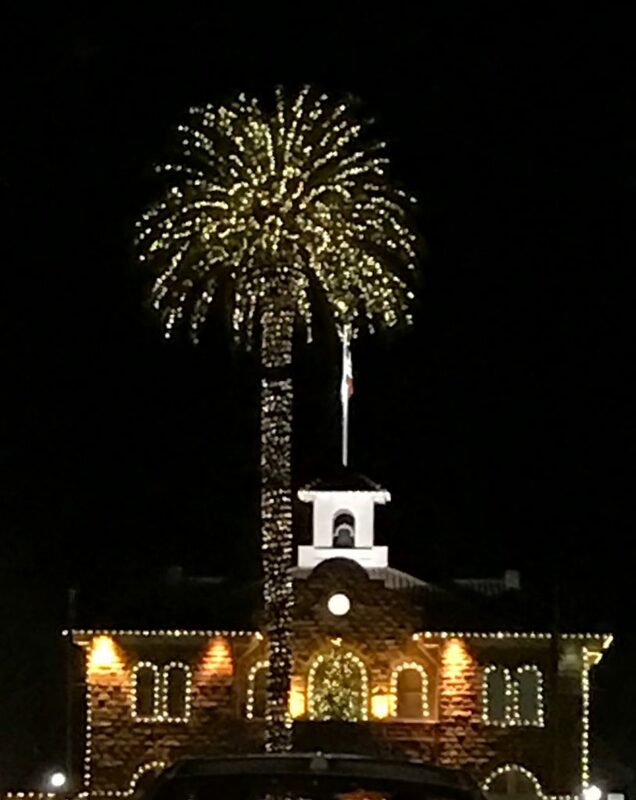 I would definitely recommend this wine and food experience if you are looking for a romantic evening on Sonoma Plaza. 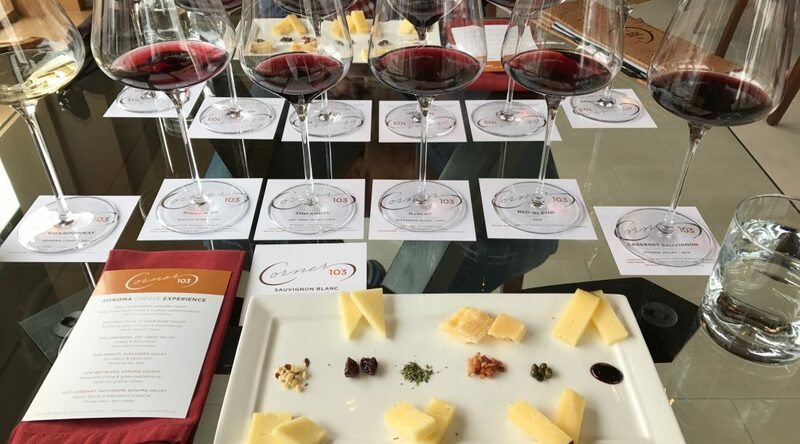 For our last day in Sonoma I had booked the Sonoma Cheese Experience ($40 per person) at Corner 103. 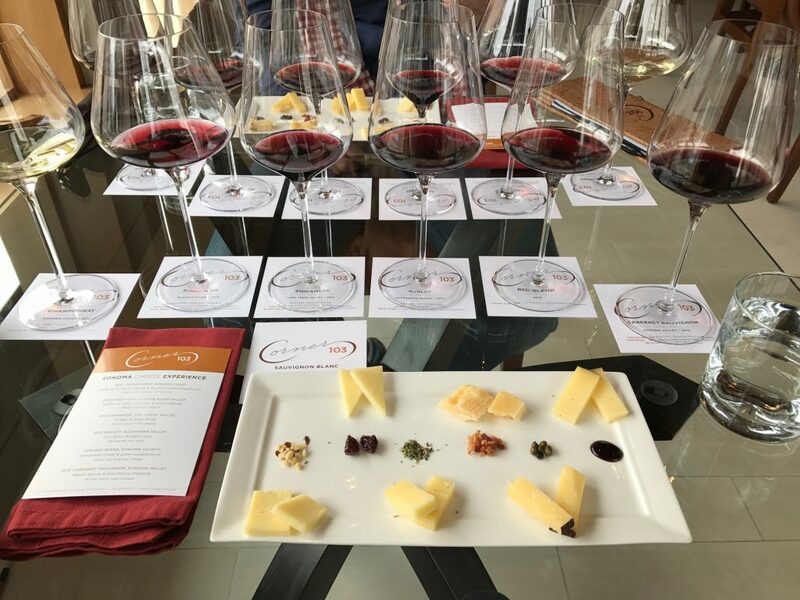 We opted for the cheese pairing since we had done the food pairing at WALT; this experience included a delicious array of cheeses from Vella Cheese Company. The tasting was provided by Corner 103 founder and owner Lloyd Davis. 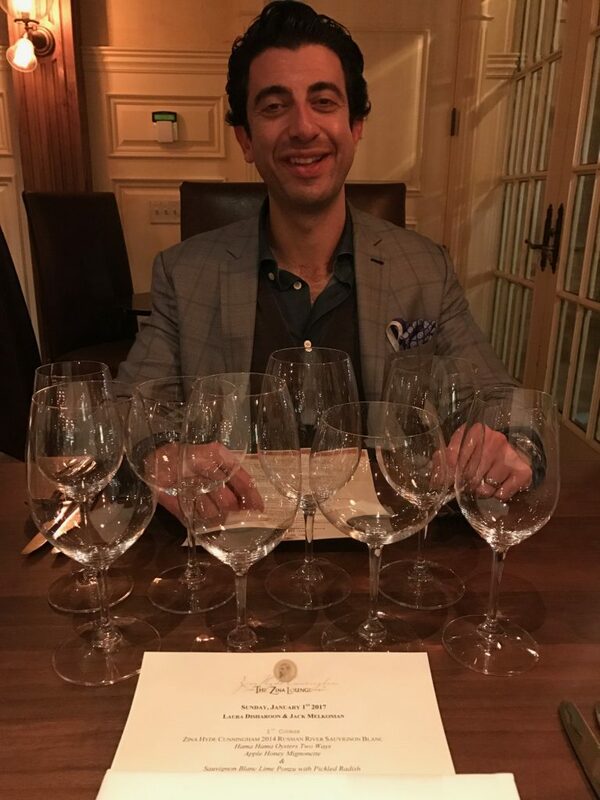 Lloyd really took his time explaining so much to us about wine and pairing food with wine: proper glassware, how to taste both the wine and food at the same time, and how to add seasonings and spices to improve the taste of both the food and the wine. When we arrived, Lloyd was finishing up with a couple of other guests, but he took the time to welcome us with a glass of 2015 Sauvignon Blanc from Sonoma Valley. Our seated tasting experience included a 2014 Sonoma Coast Chardonnay paired with an Italian Style Table Cheese (similar to a Fontina) and crushed roasted hazelnuts; a 2013 Russian River Valley Pinot Noir paired with California Daisy Cheddar (white cheddar) and dried cherries; a Dry Creek Valley Zinfandel paired with Asiago (Italian cow’s milk cheese) and herbs de Provence; a 2012 Alexander Valley merlot paired with Oro Secco (Monterrey dry Jack) and bacon pieces; a 2012 Red Blend from Sonoma County paired with Romanello Dolce (Italian dry grating cheese) and green peppercorns; and a 2012 Sonoma Valley Cabernet Sauvignon paired with Mezzo Secco (firmer fresh Jack cheese) and blackberry preserve. Afterward Lloyd also poured us a glass of Rosé Sparkling Wine from Carneros. We really enjoyed our time at Table 103. It was a rather formal experience compared to the tasting at Walt, but we learned a lot and enjoyed everything we consumed. I highly recommend making a reservation next time you are in Sonoma! Ready to delight my senses! 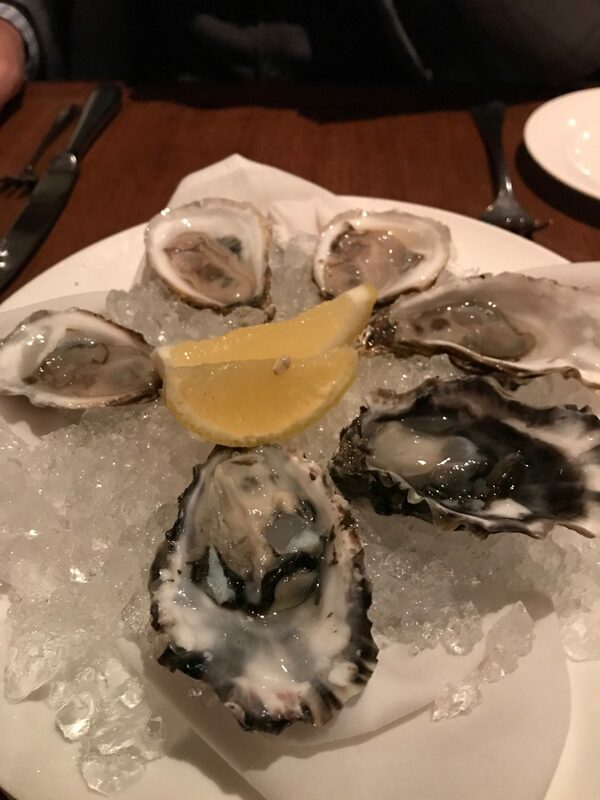 After our wine tasting, we decided to get a small bite to eat before heading back to San Francisco. Lloyd recommended a Portuguese tapas restaurant across the street named Tasca Tasca. 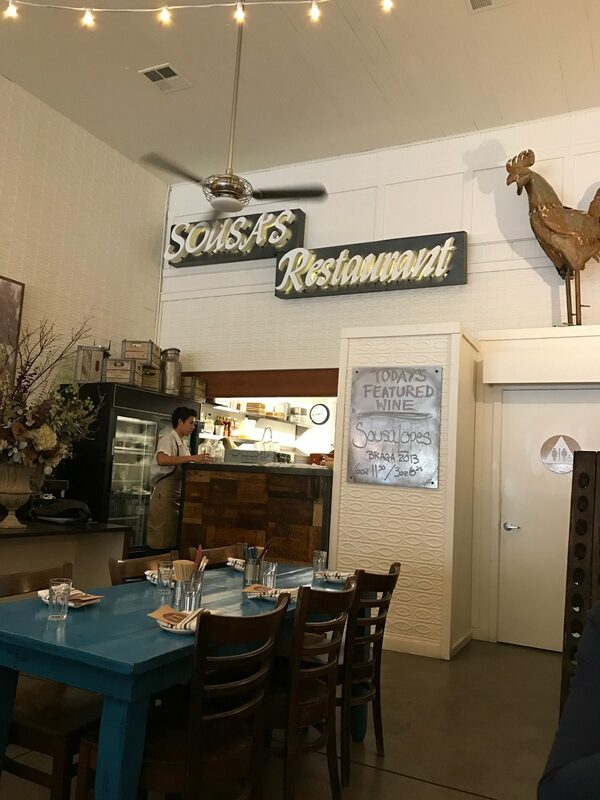 It was the perfect choice: friendly service, inviting ambiance, and delicious food that was easy to share and was perfect for big and small appetites. 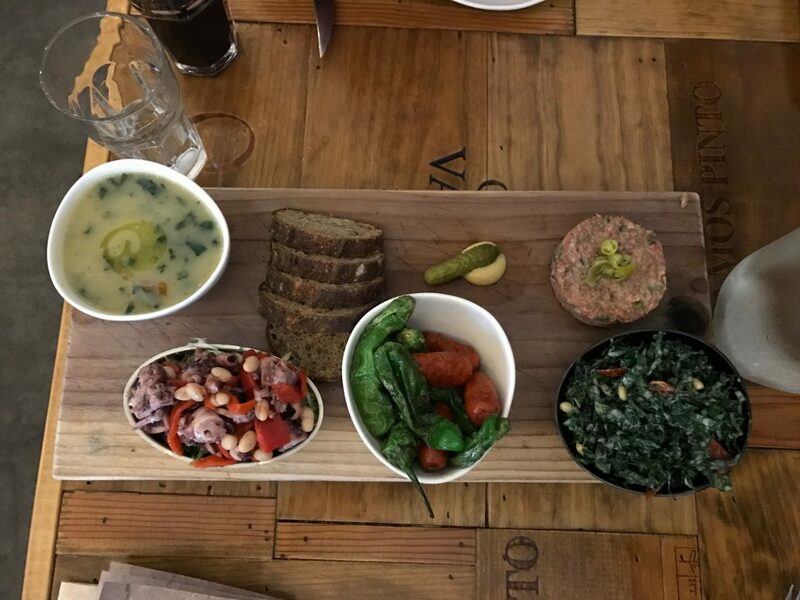 We ordered a variety of tapas including Caldo Verde (Portuguese’s national soup), octopus salad with white beans, Linguiça Caseira (pork sausage), steak tartare, and kale salad with an anchovy dressing. We enjoyed everything we ate – it was nice to try a variety of dishes, many of which were new to us. Our trip to Sonoma was delightful. 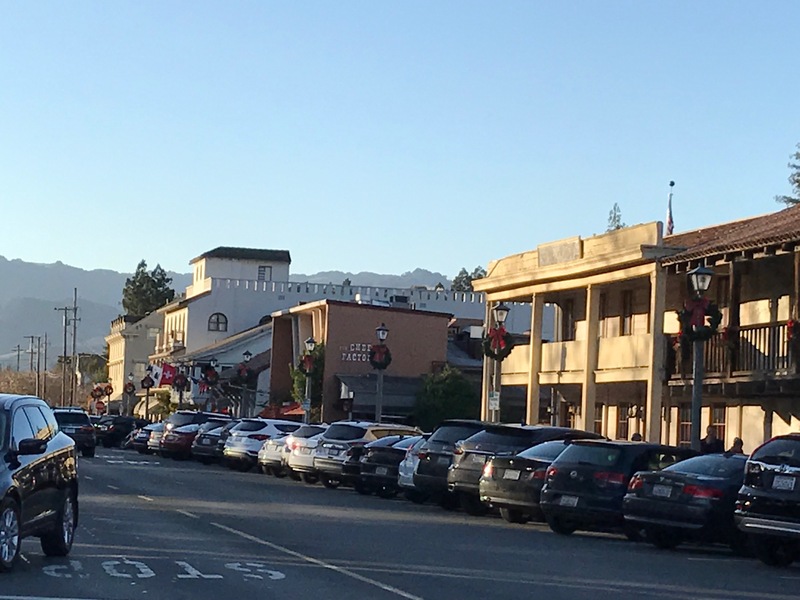 It was an easy trip logistically, and the hotel and dining experiences we chose were much more affordable than what we typically find in Carmel or Healdsburg. 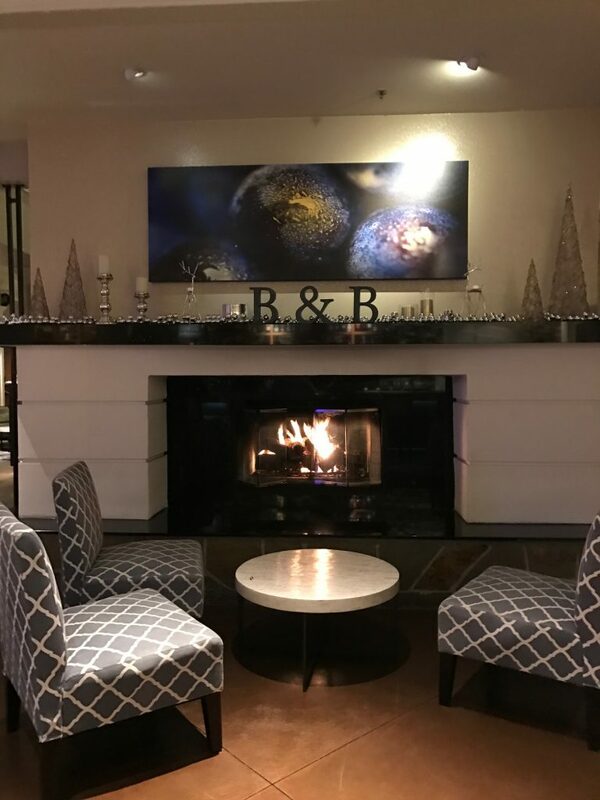 We discovered some wineries that produce wines that really appeal to our palates, and we look forward to returning soon to pick up wine from the wine clubs we joined! I love your writings about food and wine.The details are really appreciated. I am glad you sent the reminder to Facebook. I missed the previous article and will go back and look at it too. Chuck and I are eating at La Ciccia next Tuesday. Have you ever eaten there? Our son gave it to us as a Christmas present. I love eating out. We are so lucky in the Bay Area.